Whether you are an avid angler or simply enjoy the sport as a hobby, a fish finder manages to simplify the search process and improve the day as a whole. Nothing can be more frustrating than cruising out with a couple of friends and making promises of great fishing spots, only to come up short on your promises. The Raymarine Dragonfly 7PRO Fish Finder could eliminate this as a whole and improve the overall fishing experience without making you look bad in the process. The fish finder itself already proves to be a step forward in terms of fish finder tech and the Spectrum CHIRP technology transmits these sonar signals through the water and builds structured images with much more detail. 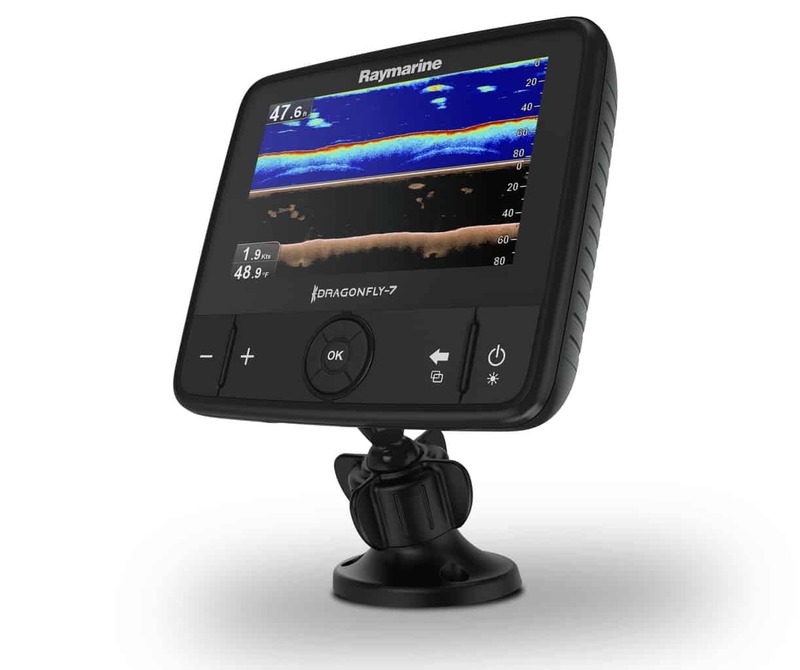 Fishing Tech gives the Raymarine Dragonfly 7PRO Fish Finder an overall A rating. The Raymarine Dragonfly 7PRO Fish Finder features some of the latest optical advanced in technology. Leading to much better pictures and better contrasts in the water. It is weatherproof and counteracts the fog found in some of the colder areas. If you ever feel like taking an underwater photo, these pictures will be closest you come. Wi-Fi is an essential part to modern fish finders, allowing you to update charts and maps and occasionally even share data and hotspots if the apps permit you to connect. The Dragonfly 7PRO Fish Finder includes Wi-Fi via the Raymarine fishing app. It enables you to share your location and hotspots with friends and other users. Having your maps updated is great for the GPS and enhancing the number of lakes you visit. A built-in GPS is crucial to finding your way in new areas and the Dragonfly 7PRO Fish Finder boast high-speed bottom tracking to keep you on the route. The GPS includes multiple different maps of the US lakes and coastal areas and US Navionic charts of waters and dangerous areas where you might not be welcome to fish. The transducer incorporated in this fish finder is considered to be transom mount transducer, constructed from urethane materials. It includes a thermometer to indicate the temperature of the water. The cable length is a healthy 20 feet and it supports both the channels of the sonar on the unit. It includes 60° vision on either side and the 2D display will serve as a 25° conical beam looking downward. The Sonar pulse is regulated at 170-230kHz for the 2D channel, while it features a frequency is as high as 320-380kHz for the DownVision CHIRP technology. While the CHIRP technology is much better than many of the competitors, you are not able to grab a screenshot of the water or objects in the water and save them to your MicroSD card. If you feel like moving it to your kayak, the fish finder enables you to simply change the installation. With a basic ball and socket mount, it can be mounted on virtually anything that you feel the need to use it on. The boat can now be used sparingly, but the fish finder can go with you on any trip and any place you feel like visiting. The mounting makes the fish finder versatile and it can be moved around on the boat, never disturbing your fishing location. The GPS and the tracking stand out as one of the key features that bring a lot of benefits to the Raymarine Dragonfly 7PRO. Losing great fishing spots can now be a thing of the past and with 3000 waypoints that can be stored, the fish finder will make every fishing day, a fruitful day and you can just return to different fishing hotspots on different fishing lakes. With 15 different track and 10,000 points each, it can be seen as storing your waypoints in sections of 100. The saved waypoints can be saved on multiple different MicroSD cards, but once the unit reaches 3000 saved points, you will be unable to save more in different units and replacing the memory card will be a great option. With a 12V battery and 4.9-foot charging cable, it enables you to mount it virtually anywhere on the boat. However, the versatility and functionality are paramount and the pivot-ball mount can be moved and turned to your liking. It also enables you to quickly remove the fish finder is needed and mount a different fishing piece of technology if needed. With a pixel matrix of 800H x 480V, the display is backlit with LED lights and optically bonded, ensuring a greater crisp in the picture and enhancing the contrast found in the water. The colors are extremely bright and the picture is sharp, creating great visibility from any angle and keeping the sun from causing distortion and disrupting the picture. Durability comes to mind when looking at the materials and the design. It is completely weatherproof, keeping the sun from damaging the optics while being completely sealed from water splashes on the screen. However, placing it in water is not recommended and might cause electronic damage that has not been covered by the warranty. The performance stands out quite a bit and this is due to the transducer and the image. It is capable of spotting rockfish around 100 feet below the surface in smaller ravines. The dark and fog prove to be no challenge for the LED backlit screen, enabling you to see anything and all in the toughest of foggy conditions. It is easy to use and navigate through and with a couple of buttons, it can be installed and you will be off and ready to enjoy a fishing trip full of great fun and great catches. The accuracy is certainly one of the most astounding features and the GPS turns out to be extremely accurate and reliable in getting out of and into different positions. While the Raymarine Dragonfly 7PRO Fish Finder is one of the top high-end fish finders and the technology might seem out of this world. It is in competition with the Garmin echoMAP CHIRP 53dv fish finder and while it might be slightly more expensive, it features a simplistic design and Garmin has been one of the trusted fish finder and GPS brands worldwide. It features a larger 9-inch display system with crystal clear imaging and a 20-feet transducer cable. However, it only has a range of 750-feet, but the DownVu technology takes away the fog and the sun from bothering your images. The memory is a larger and you are enabled to store up to 5000 different waypoints. The Humminbird HELIX 7 Fish Finder turns out to be another great competitor and while it does not have all the same features as the Raymarine 7PRO, it is a little more affordable and more compact in terms of the storage space it takes up. The problem is that you will have to buy the transducer separately and this can significantly raise the cost. Versatility is certainly one of the first things that come to mind with the Raymarine Dragonfly 7PRO Fish Finder and since it can be mounted with ease and removed, it can be interchanged between boats and even your kayak. The package is easy to understand and getting started is virtually no problem. A decent GPS is perfect for avid angler and this is why it is highly recommended to anglers in around the world. The biggest problem you might encounter is the sun warming up the drinks before having to fear any potential damage. Fishing tech will happily give the Raymarine Dragonfly 7PRO Fish Finder an A rating and recommend it for the avid angler on boats.